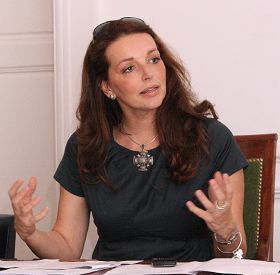 On the afternoon of October 19, 2010, Ms. Valerie Boyer, a member of the French National Assembly, held a press conference to introduce the motion she is proposing to the assembly. The motion will require French residents that go to other countries to get organ transplants to provide proof of the source of those organs. Violators will face penalties based on current law. The motion mentioned specifically the Chinese Communist Party's (CCP) crime of harvesting organs from living Falun Gong practitioners. Mr. David Kilgour and Mr. David Matas, who conducted an independent investigation on the crime; other members of the assembly; and medical and ethical specialists were invited to speak. Ms. Valerie Boyer, a member of the French National Assembly. Current French law bans organ trade, but there is no legal means to obtain information from patients who go to other countries for organs. Ms. Boyer's motion targets organ transplantation tourism, that is, when patients in rich countries who cannot obtain organs go to relatively poor countries to get organs but do not ask how or from where the organs are obtained. Often, the circumstances are tragic. The motion is aimed at French residents who go to other countries for organ transplantation. According to the proposed motion, they will need to provide proof of the source of the organs and submit that proof to the proper departments. Their doctors are obligated to inform those departments when their patients undergo organ transplantation. Member Boyer said in the conference that medical progress and organ donation make organ transplantation a miracle of the century. The demand for organ transplantation is increasing along with life expectancy. The shortage of organs leads to an increase in many unacceptable practices, such as organ transplantation tourism. She said that several of her constituents informed her about an inhumane situation in China in which organs were taken when providers were alive without their consent. This is a tragedy for some Falun Gong practitioners in China. Mr. Kilgour said in his speech that Falun Gong is a traditional practice benefiting health and that it is being persecuted brutally by the CCP. He also said that he and Mr. Matas conducted an investigation and verified the CCP's atrocity of live organ harvesting. Tens of thousands Falun Gong practitioners were killed in this way. This horrendous crime is ongoing in China. Mr. Matas briefly compared the current situations in Canada and France. He said France has banned organ trade, but there is no legal means to obtain information about those seeking organs in other countries and whether they were involved in illegal activities. Ms. Boyer's motion, if approved, would make it possible to obtain such information and penalize those violating the law. The attendees thought that this was a preventive and deterrent measure and hoped more countries would move in this direction to prohibit unregulated organ trade.